It's that time of year again, time to come back to Pennsylvania, drive up to Black Moshannon and see the family. Every year is another chance for YOU to come, even if we haven't seen you for years. Meat Dish, Plates, Utensils and coffee provided. Bring your favorite covered dish or dessert and drinks. The pavilion is located near the beach so remember your swimsuits and sunscreen!!! Share your favorite family stories and renew acquaintances. 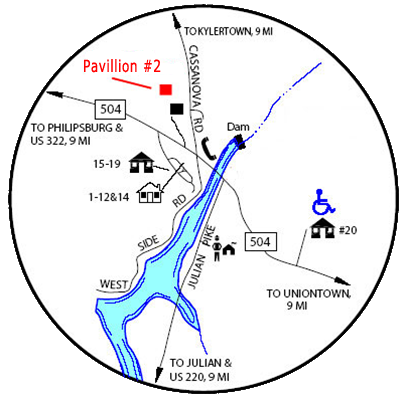 The pavilion is located on the Concession Road past the Church on the boating side of the lake. See map below for directions.